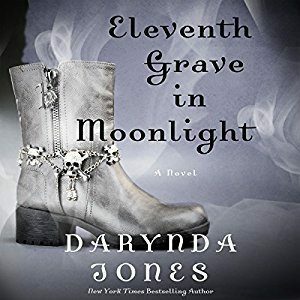 Eleventh Grave in Moonlight continues the journey of the Grim Reaper, powerful god, human P.I., Charley Davidson as she tries to protect her daughter and save the world. Charley and husband (son of Satan and also a god) Reyes are fresh from their last adventure and ready to find the second malevolent god that is walking the earthly plane. Confused? That means you haven’t read this series and truly need to start at the beginning! This eleventh title builds directly upon the events from the previous books. I absolutely LOVED the opening as Charley relays her current issues to a very confused psychiatrist. The scene is shared in true Charley fashion — full of her ADD thought process — and it genuinely had me laughing out loud. More importantly, the listener relearned the most important recent events from the previous book in a manner that was sharing rather than telling. As the book progresses, the author does a great job staying focused on a few related issues. The primary story revolves around Reyes’s adoptive parents, the Fosters, and we finally get the whole truth of why they kidnapped Reyes, only to turn him over to the malicious Earl Walker. This story has been a longtime coming and was completely satisfying. Additionally, the book spends time focusing on the larger story arc surrounding their daughter, Beep, and the prophesied end of the world. We learn more about Jehovah and Charley’s past. Again, this is a well-written storyline. What didn’t work… once again we find Charley and Reyes keeping secrets. ENOUGH! They literally just had a conversation about and wonderful agreement in the previous book (only days ago chronologically) not to keep secrets and to communicate. Charley even tosses that in the face of Reyes. But he continually walked away in anger rather than work on expressing himself. While the secretiveness wasn’t nearly as bad as in prior stories, I had no forgiveness because this is the eleventh book and it’s time to move past this particular character flaw. Additionally, I was extremely frustrated with Reyes 180-about-face when it came to Charley dying. In previous books, he obsessively worried that the human part of Charley would die, and she’d only exist on the celestial plane. In Eleventh Grave in Moonlight he suddenly has no concerns and constantly tells Charley she cannot die. What the heck? To me, this is a huge inconsistency. Add in Ubie’s attempts to keep Charley “out of danger” which were too similar to what her dad pulled on her back in the beginning of the series, and I dropped my rating a whole letter grade. While some weren’t happy with the semi-cliff-hangerish ending, I was okay with it. Maybe because I’d been warned to look out for a harsh ending. Maybe because it is very similar to a certain TV show from the 2000’s about a vampire slayer which turned out okay. I don’t know, but it didn’t break the book for me (thank you Una for your heads up on this!). The narration was flawless as usual. Lorelei King could read the phone book and I’d love it. Her talents go beyond words. She is consistent across the board, creating and maintaining unique and fitting voices for every character. She nails Charley’s ADD and often sarcastic conversations. I love how she puts me right inside Charley’s mind. In the end, Eleventh Grave in Moonlight was a mostly enjoyable listen, although I had a few issues. I absolutely loved the storylines. I found Ms. Jones’s writing to be much tighter this time around. However, I was frustrated with a few small things, which added up in the long run. Even with the issues, the stories were so good that I look forward to listening to the twelfth book and discovering what happens next for Charley and Reyes.